I have been an antiques dealer and designer for over 20 years. My discerning eye has allowed me the opportunity to work with top designers as a source for quality, continental antiques and decorative arts. As an artist, my line of mirrors and tables have also been a favorite of designers. 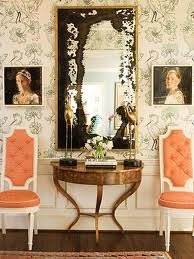 The custom mirrors and tables have been influenced by my travels and many years in the trade. These pieces are infused with a modern but classic aesthetic that transcends periods and styles. My brass, antiqued mirrors incorporate screws along the frame to give them industrial appeal with handsome, clean lines. The tables reuse antique elements and incorporate iron, steel, stone and wood. Each table is unique, therefore it is rare that I have any available. I will consider commissions to create custom projects with your architectural artifacts. Great site! Love your designs.